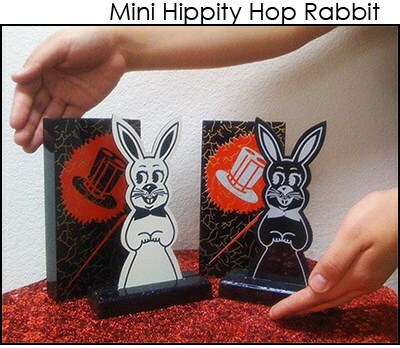 Hippity Hop Rabbits - 7"
A classic in magic, now in a 7 inch size! Two wooden rabbits-a white rabbit and a black rabbit with two wooden decorated covers are placed on a table. The wooden cover with white top hat is placed over the white rabbit and the one with black top hat is placed over the black rabbit. The trick is for the rabbits to change their places. After this amazing feat happens a few times the audience gets wise and yells out they want to see the back of the rabbits. Finally, to clear the doubts of the spectators and show your magical powers, the reverse side of both the rabbits are shown to have a Yellow back and the other a red back. These are the mini version and measure approximately 7.5 inches from the base to the ears. Community questions about Hippity Hop Rabbits - 7"
Review Hippity Hop Rabbits - 7"